(Left Door Way - Photo right). Others unknown 6 Nov 1971. Comment: Original laid down as HMS Terrible, the Majestic Class Aircraft Carrier was commissioned at Deyonport, England on the 18 Dec 1948 and was Australia's first Aircraft Carrier. 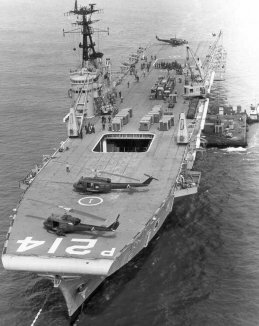 HMAS Sydney served in the Korean War and was converted to a Fast Troop Ship in the early 1960's. 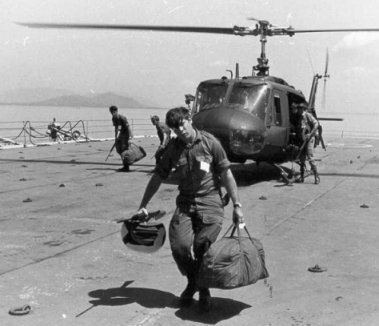 HMAS Sydney did 25 voyages to Vietnam, transporting 16,084 troop, 5753 deadweight tons of cargo and 2375 vehicles. The ship is affectionately known as the "The Vung Tau Ferry" by Vietnam Veterans. John, like many 104 Sig Sqn veterans and most of our equipment, traveled on the old aircraft carrier to and from Vietnam.